The artichoke as you can see in the picture is a lot smaller then the typical artichoke. This dish can be made by using the larger ones, but the nice thing with the smaller ones is that there is less of the hair or prickly insides in the center. Don’t confuse these with the extremely small kind that come in a package of 10-12 artichokes, which are way too small to stuff. Serve as an appetizer or as a side dish. 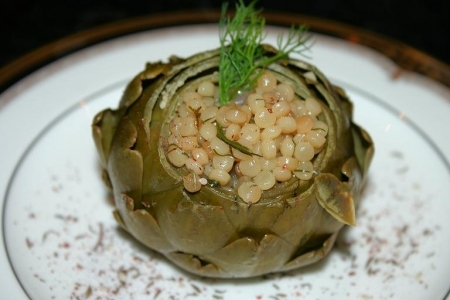 If you like this recipe try Baby Artichokes Stuffed with Fresh Mozzarella Cheese. Serves 4. Cut stem off of each of the artichokes. Then cut between a ½ inch and an 1 inch off the top of each of the artichokes. Place in large Dutch oven or large pot with salt, lemon juice and water. Cover and simmer for about an hour until leaves are tender and can easily be removed. Heat olive oil in a large skillet over medium high. Add onions, sauté until translucent. Then add couscous. Sauté for 2 to 3 minutes until lightly brown. Add tomatoes, dill, chicken broth and salt. Simmer over medium high heat until all liquid is absorbed about 30 minutes. Remove cooked artichokes from Dutch oven or pot and remove center portion carefully with a spoon. These will not have as many hairs or rough parts as the large artichokes so remove it gently. Then fill with cooked couscous and sprinkle with Zatar seasoning for an added zing!